A man (James Garner) reads from his faded notebook to a woman in a nursing home (Gena Rowlands). 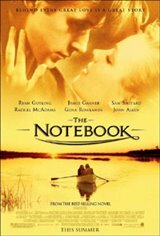 The story he tells follows the lives of two North Carolina teens from very different worlds (Ryan Gosling, Rachel McAdams). Though her upbringing takes place in an antebellum mansion and he grew up in the kind of house where musicians jam on the porch, that doesn't stop Noah and Allie from spending one indelible summer together before they are separated, first by her parents and then by WWII. After the soldiers come home, everything is different. Allie is engaged to a successful businessman and Noah lives alone with his memories in a 200-year-old house he lovingly restores. But when Allie sees an article in a local paper about Noah's handiwork, she knows that she's got to find him and make a decision once and for all about the path her life and her love must take.